Parag Milk Foods IPO is hitting the markets between 4 and 6 May 2016. In its red herring prospectus, the company said the issue will involve sale of new shares worth INR300 crore (INR3 billion) while 20,572,573 shares will be sold by existing shareholders through an offer for sale (OFS). The IPO has been kept in the price band of INR220-227 per share but retail investors and eligible employees will get a discount of INR12 per share. Applications can be made for 65 shares and in multiples thereafter. According to the price band, Parag Milk Foods IPO issue size is in the range of INR750.1 crore (INR7.5 billion) and INR764.5 crore. The upcoming IPO will be managed by Kotak Mahindra Capital Company Limited, JM Financial Institutional Securities Limited, IDFC Securities Limited and Motilal Oswal Investment Advisors Private Limited while Karvy Computershare Private Limited will be the registrar. Retail investors will be allotted only 10% of the shares offered to be sold while non-institutional investors and qualified institutional buyers will be allotted 15% and 75% respectively. 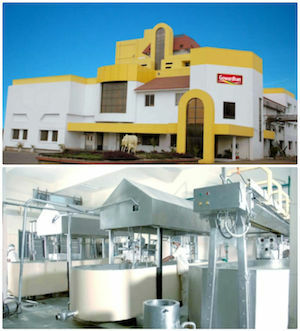 Parag Milk Foods IPO follows Prabhat Dairy’s uninspiring listing last year but comes right in the middle of a bull run which has seen tremendous listing performance of Equitas Holdings while demand has also been strong for public offers of Thyrocare Technologies and Ujjivan Financial Services. Read more to find out in this IPO analysis if Parag Milk IPO has the potential to reward investors. Parag Milk Foods’ equity shares are proposed to be listed on BSE and NSE and listing is expected on 16 May. Here are some important details about the IPO before we delve deeper in the analysis. The upcoming IPO will raise INR300 crore by issuing new shares while existing shareholders will sell 20,572,573 shares (worth INR464.5 crore at the upper price band). Shareholders participating in the IPO are IDFC Private Equity and Motilal Oswal group’s India Business Excellence Fund (IBEF). IDFC PE holds 14,134,162 shares or 20.07% in the Mumbai-based company while IBEF owns 6,676,615 or 9.48% through two funds. IDFC PE plans to sell about 82.6 lakh (8.26 million) shares while Motilal Oswal Financial Services’ IBEF will sell 60.2 lakh shares. IDFC PE’s investment in September 2012 has an average cost of acquisition of INR109.66 per share while IBEF invested at around INR40 per share in 2008. 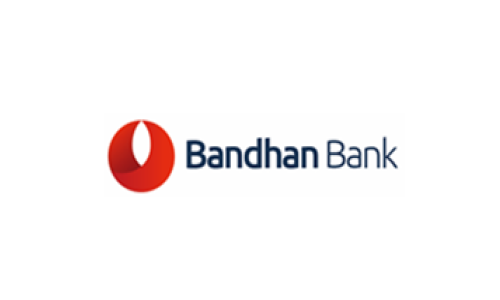 Promoters Devendra Shah, Pritam Shah and Parag Shah and the promoter group jointly own 43,045,822 shares of 61.13% of the equity capital in the company. Out of the INR764.5 crore the IPO will mobilize, the company will only get INR300 crore. Proceeds from the fresh issue will be used towards expansion and modernisation of manufacturing plants, capital investment in subsidiary Bhagyalaxmi Dairy Farm and partial repayment of the working capital consortium loan. INR147.7 crore have been earmarked for expansion and modernisation of existing manufacturing plants – Manchar Facility in Pune, Maharashtra and Palamaner Facility in Chittoor, Andhra Pradesh. Both facilities have a combined milk processing capacity of 2 million litres per day. Another INR100 crore have been allocated for partial repayment of the working capital consortium loan. Bhagyalaxmi Dairy Farm will receive a capital investment of INR2.3 crore while the remaining funds will be used for general corporate purposes. Parag has seen quite a significant jump in its business revenues. Over the last five years, the company’s top line has grown at an average compounded rate of 21.6%. During the financial year ended March 2015, Parag Milk Foods posted a top line of INR1,440.5 crore, up 32.5% from previous year’s INR1,089.5 crore. Similarly, its profits zoomed 62.6% to INR25.9 crore in FY2015, according to the company’s red herring prospectus. However, a look at Parag’s finances in the last five years reveals the company is not consistent with its profits and margins have been fluctuating between negative 0.1% to 2.2%. 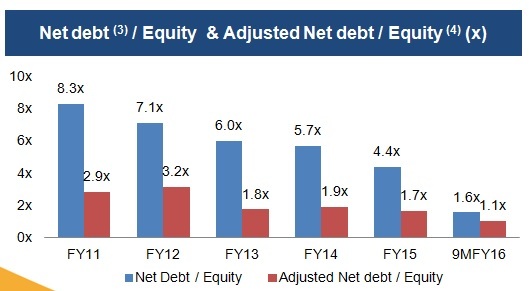 We are not big fans of businesses with single-digit profit margins but a visibly positive factor with Parag Milk Foods in recent years has been the remarkable drop in debt levels. The image below captures this turnaround very well. That’s good but should you invest? The closest reference point for Parag will be Prabhat Dairy which had to lower price band and reduce share sale to sail through the IPO last year as investors showed little interest in the public offer. Parag does a little better in this department with a discount of INR12 per share. It is important to highlight that Prabhat Dairy also offered a discount of INR5 per share and yet its IPO flopped. As a matter of fact, shares of Prabhat Dairy are still trading below the IPO price of INR115 per share. Our objection to Prabhat Dairy was with valuations and things are not any better with Parag Milk. In FY2015 – the year when its margins improved – the company had a consolidated EPS of INR3.81. The PE ratio works out to a very steep 59.6 times on the basis of FY2015 consolidated earnings. Now the nine month results of FY2016 are much better and we fully acknowledge this. Strong performance in the nine month period reduces the PE multiple for FY2016 to 36.5X and the discount for retail investors makes the deal more appealing. Without going into specifics (feel free to read more here), Parag is one of the leading manufacturers and marketers of dairy-based branded foods in India and supplies to lot of big names including Pizza Hut, KFC, Domino’s Pizza and Sam‘s Pizza. These are strong credentials but our basic contention remains the same – why should an investor pay 30 or 35 times of earnings for a low margin business which earns just 2% in profit. One of the common places to look for promoters’ regard for shareholders’ success is the executive compensation and we were able to identify some of the bad IPOs on this indicator alone (see here and here). The Chairman and Managing Director duo of Devendra Shah and Pritam Shah received nearly INR1.2 crore each. This is reasonable and not excessive or questionable. This is something we like. Another point worth highlighting is the IPO’s structure which is geared towards low retail participation. By offering only 10% shares to the retail category, practically speaking the flood gates are open for operators. We have seen this happening in the past so we will not be surprised if Parag Milk Foods IPO eventually lists at a slight premium. Retail investors need not take this unnecessary risk. Overall, we are neutral on this IPO. There are certain things to like such as the steady growth of business; however, valuations still appear on the higher side to us. We are convinced that there are better IPOs in store for retail investors and avoiding Parag Milk Foods IPO is not going to cause serious damage to their portfolios. The IPO is as hazy as milk in a crystal clear glass. Difficult to make out what exactly is inside! I wonder why dairy business is aspiring to such premiums? Is it ‘behti Ganga mein haath dho lo’ types playing the wave of bullish IPOs? i dont like the valuations and i wish some sense prevails and we all collectively punish greedy valuations. Of course, real life is not that simple. Good luck to those who go for lofty valuations. Gravity should bring some sanity soon, rather than later. Rightly said, looking at what happened to Prabhat Dairy, there is no point of investing in Parag. There is no activity in grey market also.